We thoroughly enjoyed this tour. Although it made for a full day, we did not feel rushed at any site. Our guide was knowledgeable, friendly, professional, and very helpful. The Thames River ride also worked out well as we were able to depart the boat just a few steps from our hotel. Leeds castle was quite charming. It was easy to navigate through the castle rooms and grounds. The dog collar museum on the castle grounds should not be missed! Canterbury Cathedral map and history was explained by our tour guide Sandra before entering the cathedral. It would have been helpful if a cathedral guide had met us inside to answer questions and point out historical and physical details of the cathedral. It is quite large and there is much to explore and view. Chis our bus driver was familiar with roads that brought us closer to viewing Dover Castle and the Cliffs.The boat ride on the Thames was sn unforgettable way to end our day. Lots of photo ops especially on the back of the boat. I really enjoy this tour, one of the best tours for me and I really use that type of service whilst traveling. The guide tour was amazing, really knowledgeable and fun. Thanks! If the bus is full, some guests have to sit in the back row. On this trip there were five of us jammed together. The backs don't tilt back, but the ones in front do. making for a very uncomfortable ride. I would not recommend booking with this company. our tour guide was very knowledgeable and the day was well planned. Unfortunately we were left in cantebury for a much longer time due to something that happened to the coach and we had to wait for the coach driver for quite a log time. However, we managed to get a later boat to take us along the river back to London. Although we were in a rather crowded bus, we enjoyed this a lot. It seemed very relaxing and our guide, Dolly, kept us moving without feeling rushed. We did find it a bit disconcerting to try eating a box lunch on the bus with no tray. It was quite a balancing act. 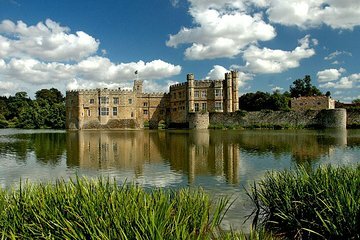 I have always wanted to see Leeds Castle. It was every bit of beauty I imagined it would be. I can only imagine what it looks like in the spring when the flowers are in bloom and the sun shining. Compared to Windsor , I could actually imagine myself living in this castle. You can even rent out rooms for a wedding. If you are fascinated with castles, this is a must see. Canterbury Cathedral was under going some exterior renovations but you could still appreciate it's beauty...both inside and out. White Cliffs of Dover are situated just beyond a beach. Nothing like our beaches back home and of course in March the only ones on the beach area were the tourist, me included. The end of the tour was a cruise on the Thames River. It dropped us off right in the area of the London Eye and Big Ben. I was able to grab some more photos before I found my way back to the hotel. The only thing I wish the tours would do is drop us off at the hotel but because everyone is staying at different locations, it's impossible. I was familiar with the tube so getting back to my hotel was very easy for me on this tour. It's an all day tour but worth it. You get to see 4 different areas outside of London. If you are not comfortable driving a car on the other side of the road, this is the best way to get around to seeing things. An excellent tour. Our guide was extremely knowledgeable. My only extra comment is that the Golden Tours office was not well set up.....really, shouldnt they have clean rest rooms available before 40 people leave for a bus tour?